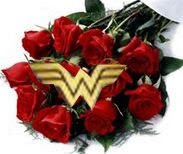 It's the Wonder Woman award! I am so honored to receive this, and it also gave me a chuckle, because, as you probably know, I've been known to post about people expecting me to "be able to be Wonder Woman, but I lost my cape". Well, I may not have found my cape, but now, even better, I have the award! And then... then I realized that the sweet and generous Mama Pajama had previously given me another award awhile back that I haven't even posted yet. This one is extra special to me, because I am now a devoted blogger and have made so many very special and wonderful friends that has caused me to say thanks every night for being a part of the blogging community! Can you believe this? I honestly am so touched that I received these awards. Thank you so much Mama Pajama! You truly have made my day... heck, you've made my whole week... probably even my month! I will pass these awards on to my special friends tomorrow, because, right now, I need to go get ready... hopefully, the Hubs and I are going out to play pool tonight... I've been really looking forward to it, since we haven't done anything fun together for quite awhile. Congratulations!!! Very cool!!! Have fun playing pool. Once I actually hit the eight ball in off the break. You deserve it. (smile) Hope you have fun playing pool. That sounds like a lot of fun!